Images for the game between Miami and Ohio State played at Value City Arena in Columbus, Ohio, on Dec. 31, 2016. All images by Cathy Lachmann. OXFORD, Ohio – Ryan Larkin deserved better than a tie. 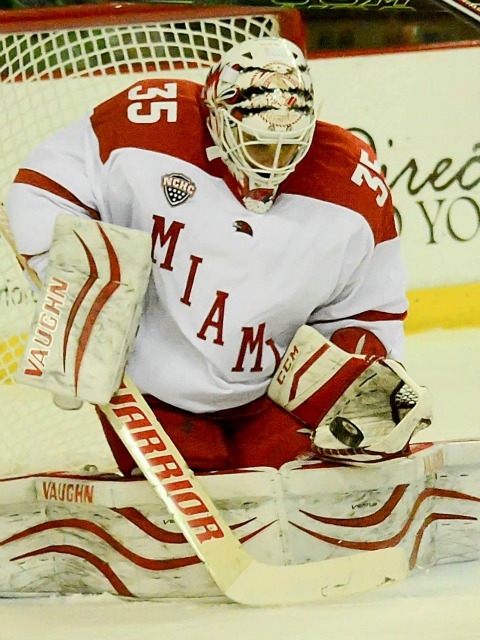 The Miami freshman goalie stopped 23 of 24 shots including multiple point-blank chances late as the RedHawks and Ohio State finished even at one in Miami’s 2016-17 home opener at Cady Arena on Saturday. Larkin, who has been the lone goalie to log minutes for MU this season, denied a breakaway in the third period, and after making the initial save on an overtime rip, he stretched to his right to cover the post, narrowing denying a rebound shot from the side of the net. After allowing four goals in Miami’s season opener in Providence, Larkin has stopped 43 of 45 shots (.956), surrendering just two goals in 124:58 for a 0.96 goals-against average in his last two outings. 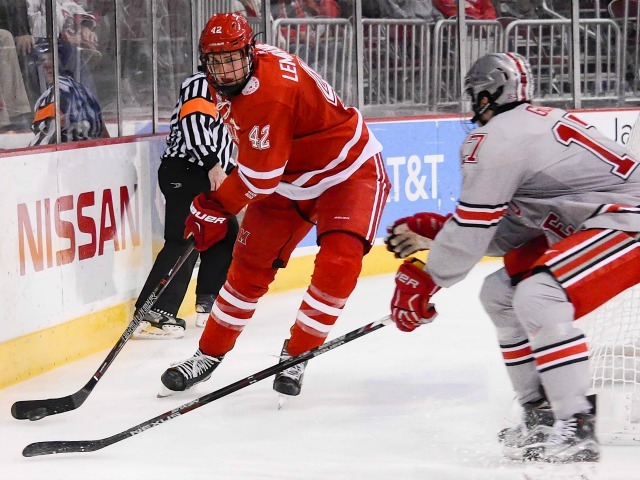 The Buckeyes (1-0-2) struck first when David Gust slammed home a rebound after Larkin had stopped a shot from the high slot by Dakota Joshua just 4:32 into the first period. Miami goalie Ryan Larkin made this third-period save to preserve the tie (photo by Cathy Lachmann/BoB). 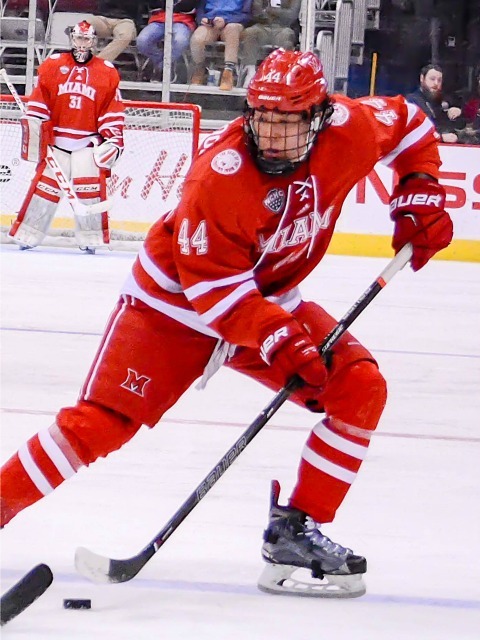 The RedHawks (1-1-1) tied it on a 5-on-3 when junior defenseman Louie Belpedio ripped a shot that beat OSU goalie Matt Tomkins just inside the far post 4:11 into the second period. 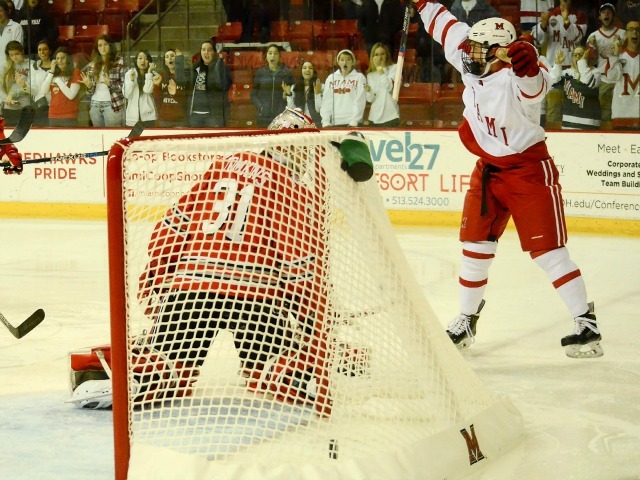 Miami hit a pair of posts on quality scoring chances, one off the crossbar by sophomore Kiefer Sherwood in the middle stanza and another by freshman Karch Bachman that rang off the far post late in the final frame. 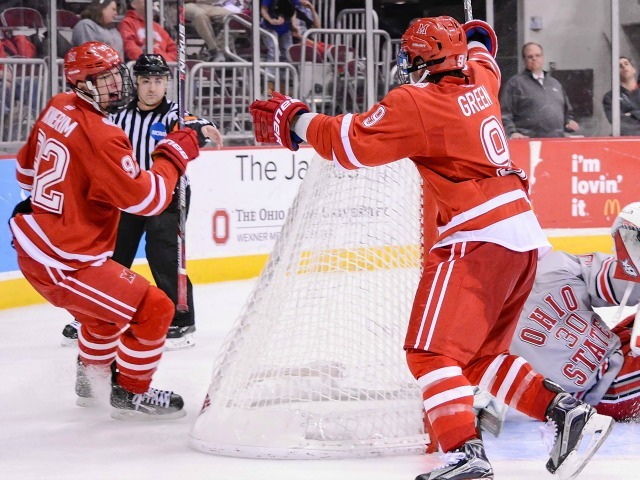 Ohio State dominated the overtime, outshooting the RedHawks, 4-1 and spending 1:59 on the power play. After overtime, the teams played an exhibition 3-on-3 to no avail, and finally the Buckeyes won a shootout that also did not have any bearing on the standings or rankings. Belpedio and Sherwood, who picked up an assist on Belpedio’s goal, lead the team with three points each. Senior forward Anthony Louis also picked up a helper, his first point of the season. Miami has scored six goals in three games this season, and all have come on the power play. All of its contests to this point have been decided by one goal or zero. 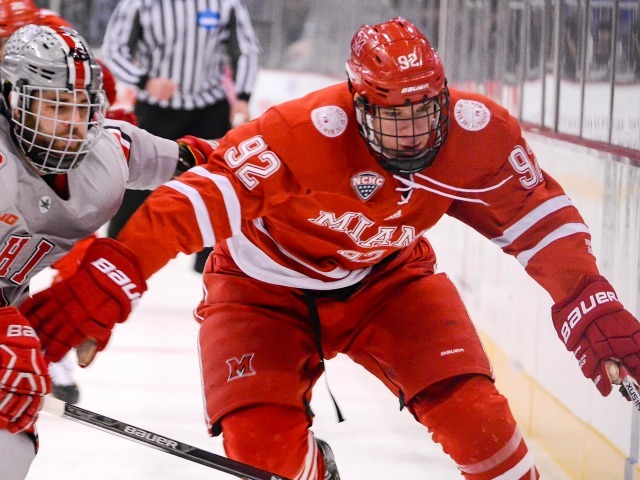 The RedHawks host Maine next weekend, with faceoffs slated for 7:35 p.m. on Friday and 7:05 p.m. on Saturday. OXFORD, Ohio — Miami’s youth continued to shine offensively on Saturday. 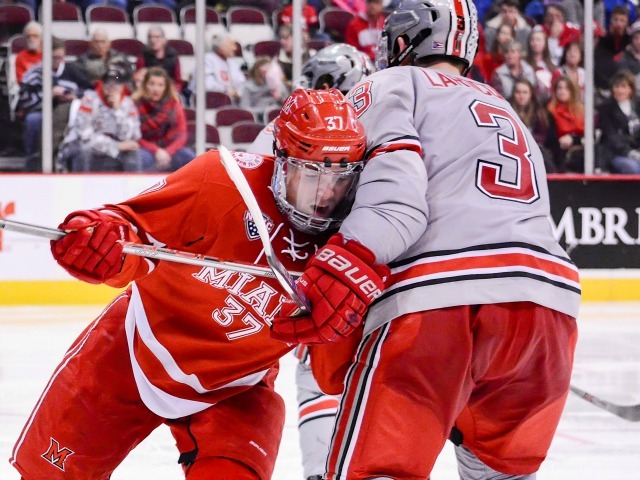 Freshmen scored all three of the RedHawks’ goals in a 3-1 win over Ohio State at Cady Arena in the series finale, a night after edging the Buckeyes in Columbus. 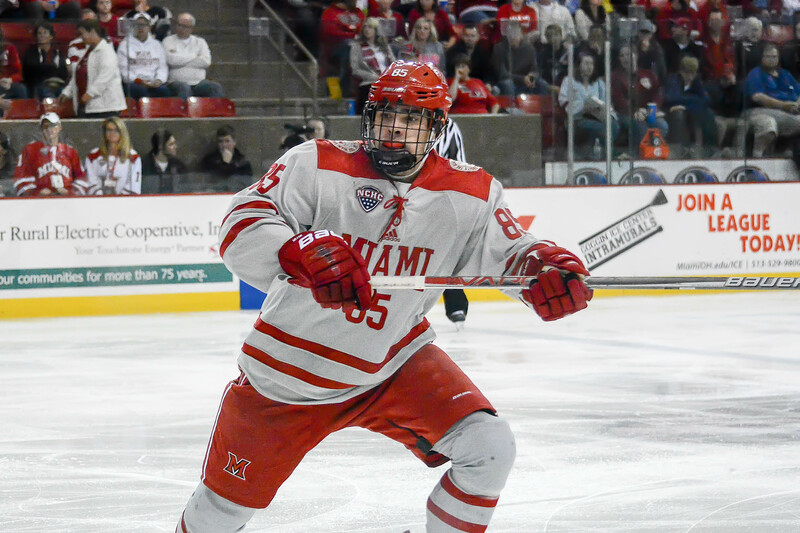 Forwards Josh Melnick, Jack Roslovic and Zach LaValle all found the net in the win, Miami’s sixth straight in its all-time series vs. OSU (0-4). Roslovic set up Melnick’s goal to open the scoring when he whipped a cross-ice pass for a one-timer on the power play with 7:49 left in the first period. 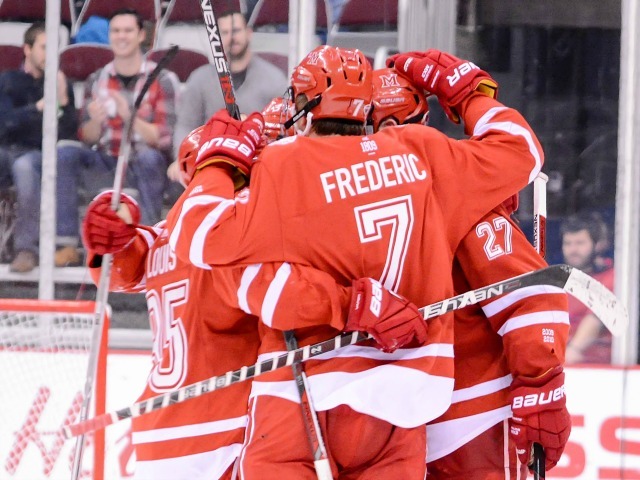 Like Friday, after the RedHawks (2-1-1) took the initial lead, Ohio State tied it. A wrist shot from just inside the blue line by Mason Jobst eluded Miami senior goalie Ryan McKay 5:11 into the second period to make it 1-1. Roslovic put the RedHawks ahead for good when he beat two defenders and roofed a shot with 6:04 left in the middle stanza. Melnick picked up the lone assist on that goal after a steal in the neutral zone. Miami’s Zach LaValle scores his first career goal to ice Saturday’s game (photo by Cathy Lachmann). LaValle jammed a rebound home off a shot by Kiefer Sherwood – another rookie – with 17:55 to play in regulation, sealing it. That goal also came on the man advantage, on which Miami finished 2-for-5. Melnick and Roslovic finished with a goal and an assist each, as they are tied for the team lead with five points apiece. 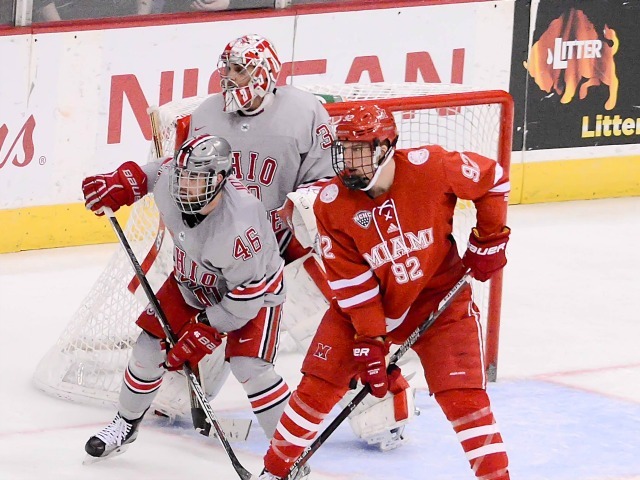 Of the eight individual points earned by Miami in this game, six were by freshmen – two each by Melnick and Roslovic and one apiece by LaValle and Sherwood. Junior forward Anthony Louis and senior defenseman Matthew Caito also picked up assists. Louis finished with nine of the RedHawks’ 41 shots. McKay stopped 27 to earn the win for the second straight night. The RedHawks’ first significant road trip of the season is this weekend, as they travel to St. Lawrence for a two-game set. Both games will be at 7 p.m. Following those games, Miami travels to St. 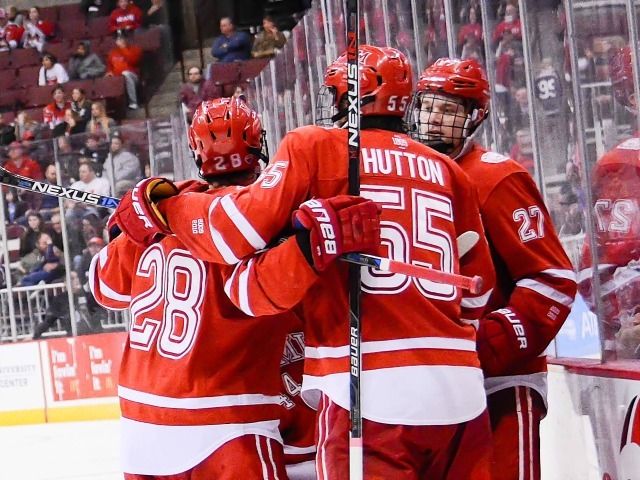 Cloud State to open NCHC play on Oct. 30-31. COLUMBUS, Ohio – Granted it wasn’t against a top-10 team, but getting into the win column has to be a huge moral victory for Miami, especially on a late game winner. 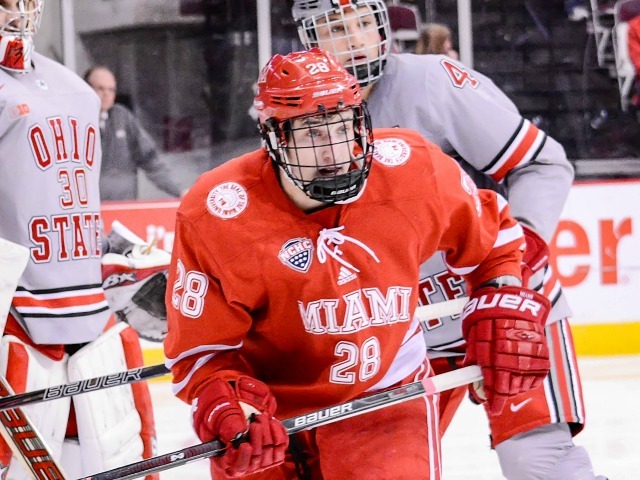 The RedHawks won their road opener at Ohio State, 3-2 at Value City Arena on Friday on a rebound goal by Columbus native Jack Roslovic with 1:33 left. Miami has a plethora of new forwards this season, and many are in the starting lineup because of their abilities, and also with three extra skaters on the roster including one blueliner, it was obvious most or all of them were going to get the opportunity to play. Seeing four of them into the points column in this game (Roslovic, Josh Melnick, Kiefer Sherwood, Ryan Siroky) had to be a mental boost for all of them, and getting that first win does everyone good. The offense was a concern heading into this season, with so many ultra-talented players from 2014-15 departing. But this team has scored eight goals in three games, which is neither bad nor good, and better things are ahead for this team. One can see the passes that just miss, the chemistry that is still developing, the shots that aren’t quite perfect enough to hit the net. And let’s face it, the Ohio State ice does not exactly rival Edmonton. We’ll say it again: The defense will be fine. Heck, Colin Sullivan was scratched in this game and he scored a beautiful goal last Friday and made very few mistakes last weekend. The goaltending? Two fourth-year starters there. Can’t get more experienced there in college. With the 2015-16 team, the question is always been about scoring enough goals. Three games into the season, Miami is already scoring at an OK clip, and the offense should only improve. – Can’t say enough about how much better senior Alex Gacek has been this season. He kills penalties, he passes, he hits people – which almost defies physics at his size – he defends, he’s doing pretty much everything. Gacek finished strong in 2014-15 and it was hoped that would carry over to this season, but he has exceeded those expectations. – Also impressed with the step up taken by senior Kevin Morris. He’s been seemingly everywhere so far this season. – On defense, senior Chris Joyaux seems to have taken a big step forward as well. He was scratched for the season opener last week but has really earned a spot in the lineup with his play since. – Senior Taylor Richart has been shooting and generally getting involved in the offense a lot more, which is a good thing. 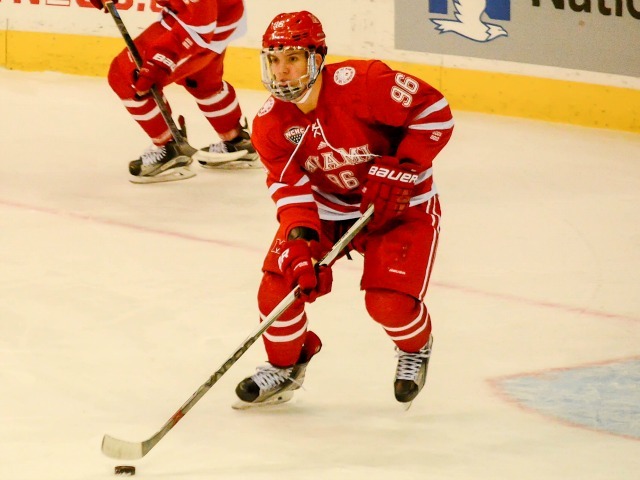 He had a shot redirected into the net last week, and he was firing from the blue line again on Saturday and pinched into the play several times. He’s such a smart player that he can be trusted to pick his spots while jumping in without getting caught. – How about that Crash Cousins line? Andrew Schmit scored the first goal, and the whole line of him, Conor Lemirande and Ryan Siroky played well together. On a team that really only has two scoring lines at present, it was great to see this trio step up. – Let the controversy begin: Josh Melnick is the best overall forward on the team right now. He’s an absolute pest on the PK (and how much confidence does Coach Enrico Blasi have in him to put a freshman right into the mix on the top PK unit? ), he passes incredibly well, he goes into corners and win battles, he scores, he defends very well and steals pucks. Three games in, this kid is the biggest story on the team, especially since everyone knew Roslovic was going to be unreal. Roslovic hasn’t disappointed, Melnick has just been that good. And oh yeah, that winning goal? Melnick made that happen with a picture-perfect centering feed to Morris from along the boards. – The penalty killing has been excellent. Miami allowed just two shots on three man advantages and is now 12 of 13 (92.3 percent) early in the season. 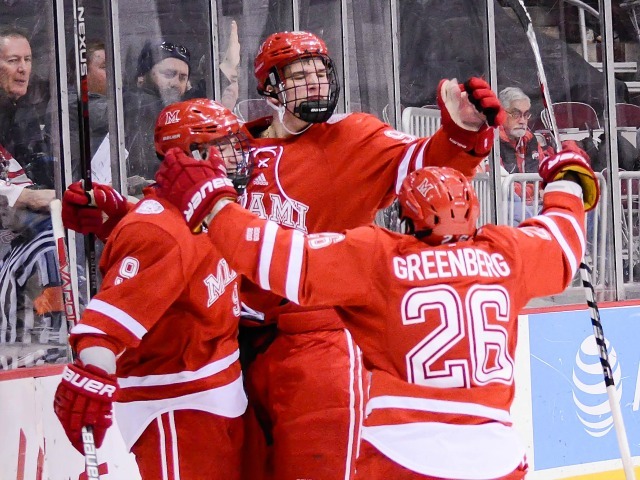 Again, defense, goaltending, not a surprise this is a strength for the RedHawks. Add in a rejuvenated Gacek and Morris, plus Melnick up top and this team could stay above 90 percent this season. The power play on the other hand…but that will get better. Let’s hope. – Kudos to Miami fans and event organizers who helped get Red and White fans in the seats for this game. RedHawks fans easily outnumbered Ohio State fans in the Buckeyes’ own rink and made a lot of noise. It’s possible there were more Miami fans at this game than at either for opening weekend at Cady. FORWARDS: B. Miami missed some shots it should’ve buried early but got the big one from Roslovic when it needed it. In addition to the others mentioned above, Anthony Louis was more involved all around although he didn’t get on the scoresheet. 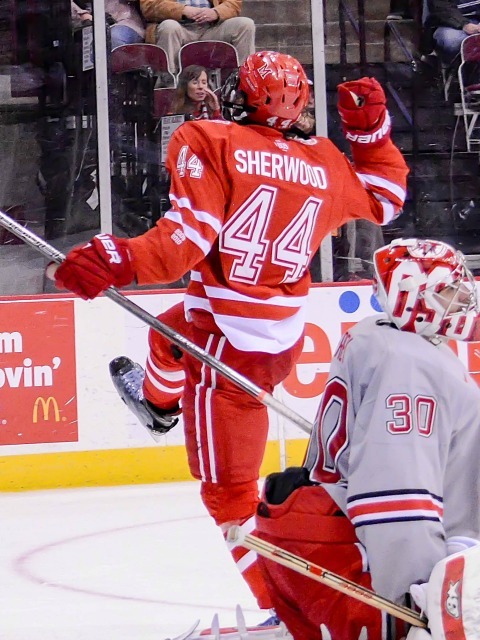 Sherwood was OK in the opener, scratched for Game 2 and much more of a factor in this game. Overall there was a lot to like from this group, but the RedHawks’ opponent was nowhere near Providence level. DEFENSEMEN: C. Belpedio fell into the boards with the puck, which directly resulted in the first goal against. On the second one, it looked like freshman Grant Hutton lost Anthony Greco as he skated to the net, resulting in the one-timer. Sophomore Scott Dornbrock, Joyaux and Belpedio all took penalties, and for the latter, that’s four minors in three games. Dornbrock struggled early but got better. GOALTENDING: A-. McKay stopped 25 of 27 shots (.926) but after Belpedio slipped on the first goal, McKay was left out of position (he understandably couldn’t have anticipated Belpedio losing the puck there), and the second one was a point-blank one-time run he had no chance on. McKay didn’t face many other tough chances until the six minute of the third period, when Miami took a shift off and McKay had to make three great saves. He’s been very solid so far this season. LINEUP CHANGES: Sherwood was dressed in place of senior Michael Mooney, and Dornbrock played in place of Sullivan. One could envision Blasi going with the same 12 forwards tonight, and which defenseman will sit is anyone’s guess, but Sullivan certainly should not be scratched every night. McKay started for the second straight game, which was interesting because Jay Williams was in net for the opener, so it’s unclear what Blasi will do for the finale. Knowing Blasi he won’t let Williams rot on the bench over one game, especially since numerous goals scored in that tilt weren’t his fault. Sing a song! Miami Sweeps Ohio State on opening weekend! We partied too much on Saturday night and you have permission to give us a tongue lashing when you see us in Oxford this weekend for skipping out on the Twitter SixPack and our new Three Stars feature. We’ll be more diligent with the SixPack in the future. Promise. Time for some news you can use after last weekend’s games. That’s obviously the first weekend of our season against our huge in state rival and its a huge start for us. We’ve been opportunistic with our chances and if we’re going to play with this intensity, scoring will come. But we still have to clean things up. We’ve got to manage the puck a little bit better and be more determined away from the puck. I thought our defense handled themselves well – I thought we saw a lot better gap control tonight but we’re still a work in progress, and we have to get better. We’ve got to forget about what happened and get ready for our next game. 3. Enrico Blasi and the Power Play unit. On Friday night, Blasi deployed 5 forwards on their 2 early 5-on-3 power plays, and why not? They scored twice, so it was clearly the right move. On Saturday, Miami again scored a power play goal, this time on just a normal 5-on-4 scenario. On the ice were Riley Barber who scored the goal, Austin Czarnik, Blake Coleman and Max Cook, plus Matthew Caito – Miami’s best offensive defenseman. Miami is now 4 of 10 on the power play in 2 games, having scored in both games. Sat’s PPG came in just 14 seconds of PP time as well. 2. Austin Czarnik had 4 points (1-3–4) on the night. Add in a goal from Friday and he still wasn’t even close to our #1 star for the weekend. But Czarnik was, as usual, all over the ice and looked like the best player on either squad and an early season Hobey Baker favorite. 1. Was there any question that Riley Barber would get this slot? Barber had 3 assists Friday and 4 goals Saturday (let’s see if he can keep up 3.5 points per game this season!). 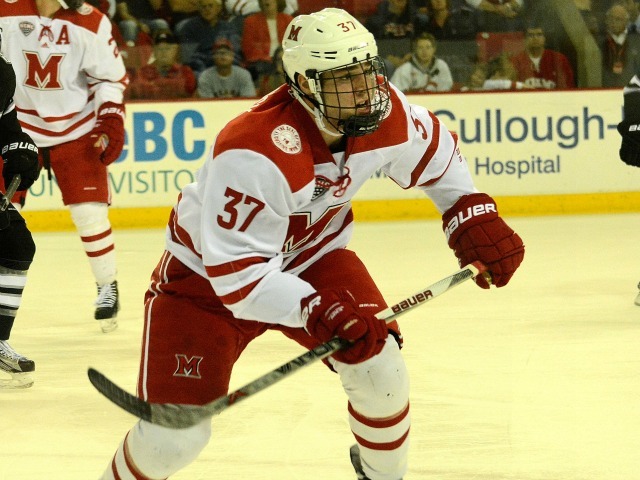 Barber becomes the first RedHawk to score 4 goals since Tommy Wingels did so in December of 2009. Check out the Saturday night highlights from Miami All-Access and Rachel Lewis’s Photo Gallery of Saturday’s game. By now you know that Miami sits firmly atop the National Polls. What you may not remember is that the last time Miami played North Dakota on November 28, 2009, they were amidst a 12-week run (their longest ever) at #1. North Dakota was #4 at the time. Barber and Hamilton garner two of the four first-ever NCHC weekly awards. 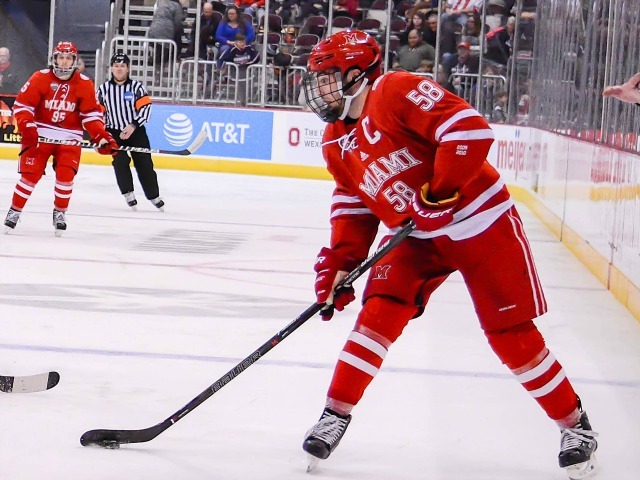 You know what Barber did – basically undressed Ohio State for two nights, notching 3 assists and 4 goals, to earn the first NCHC Player of the Week. Trevor Hamilton is one of the new faces in Oxford, and had 3 assists and was a +4 on the weekend to earn Rookie of the Week. Read all about it from the NCHC. Miami has lost just 3 of its last 29 home games. And UND has lost just 4 of its last 31 home games. After playing UND this weekend, Miami then heads out to Providence, RI for a return date with the Friars after they came to Oxford last year. 5 points against OSU this weekend. This past weekend’s game had me singing “takin’ care of business” after the RedHawks took 5 points from Ohio State in their own barn in 2 hard-fought contests. We expected some gritty hockey with lots of big hits and a whole lot of energy, and what we received for the weekend was well worth the admission price. Both games were very intense, with Friday night’s game going all the way to a shootout, and Saturday’s coming down to some staunch defense in the third period for an exciting 3-1 victory. Here are some game notes and our weekend recap. Miami had only 5 shots in the entire first period. Ohio State had 10 for the first, but didn’t register their first shot until 6:45 into the game. After the slow start and subsequent slow second period, the Hawks had us thinking that we were headed for a “Rico Swoon.” We’re also happy it didn’t end up that way. At 11:25 of the third, Krogh then took what would turn out to be a very costly penalty. At 12:43 of the period, Riley Barber made a slick pass into the slot area and Curtis McKenzie drilled a 1-timer that found twine, and the game was tied. The power play goal was McKenzie’s 3rd goal of the season, and it earned him the #1 star of the game. It was nice to see Curtis was flying around the ice throwing body blows all night. He ended the night with a team-high 5 shots and also recorded 2 blocked shots. The defense and goaltending were the stories of the night on both sides. Miami was limited to 5 first period shots and just 7 in the third. Ohio State had more shots in overtime (4) than they did in the third (3), and had just 23 total on the night. Somehow, Ohio State goalie Brady Hjelle was named the #2 star of the game ahead of Jay Williams, who won his 8th game in Oxford and stopped all 3 shootout attempts. For the season, Miami has now faced off with 4 different opponents in shootouts and has not allowed even one attempt to find the back of the net (3 wins for Williams and 1 win for Ryan McKay). In a somewhat troubling statistic, Miami’s record in the faceoff circle was a paltry 22-41. Austin Czarnik had a rough night all around, and won just 2 of the 19 faceoffs he fought for. Ohio State’s Tanner Fritz was 19-3 on the night, and this was likely a big contributing factor to the sloppy looking play for the first half of the game. Czarnik made up for his rough night on faceoffs with yet another sweet move in the shootout. He beat Hjelle with a forehander that had it all: speed, deception and creativity… AND he roofed it over the goalie’s shoulder. We’ve got the video of the goal (and the game winning save from Williams) below. Blasi put a somewhat strange lineup on the ice for the night. Bryon Paulazzo, Jimmy Mullin and Taylor Richart got the night off, possibly because of finals week. There were no indications of injuries, and only Paulazzo did not play on Saturday. Ryan McKay was the story on Saturday and almost came away with his 3rd shutout in just his 5th career start. 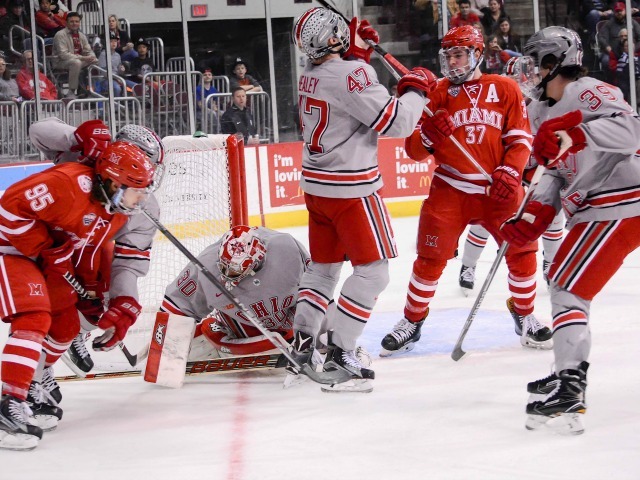 Unfortunately, after spotting OSU a 2-0 lead, he did allow a goal 6:20 into the third, but he stood tall and stopped the flurry of shots Ohio State threw at him the rest of the way, stopping 22 of 23 on the night. McKay allowed just 1 goal on the night, the third ever of his young 5-game career, and it was the first even strength goal he has allowed. 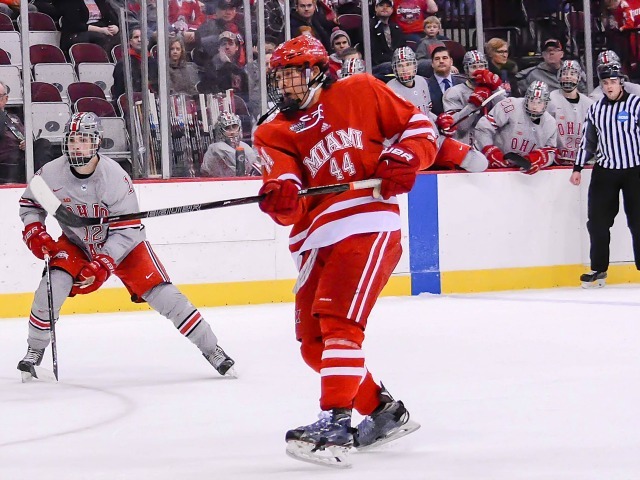 Alex Gacek scored his 3rd goal of the season in the first period, and from there Miami settled into their shell and just stifled Ohio State the rest of the way. Blake Coleman returned to the scoring sheet, as he assisted on Gacek’s 1st period goal and scored the eventual game winner in the second. Miami was 5 for 5 on the penalty kill, and did not allow any shots on the power play until the 5th and final kill, which started with 12:39 left in the third period. Once again, no mention of a Miami goalie in the 3 stars of the game, where Coleman, Hjelle (!?!?!?!?!) and Riley Barber took those honors. There is no explanation other than being a home game for Ohio State that Hjelle got the 2nd star of the game nod each night. 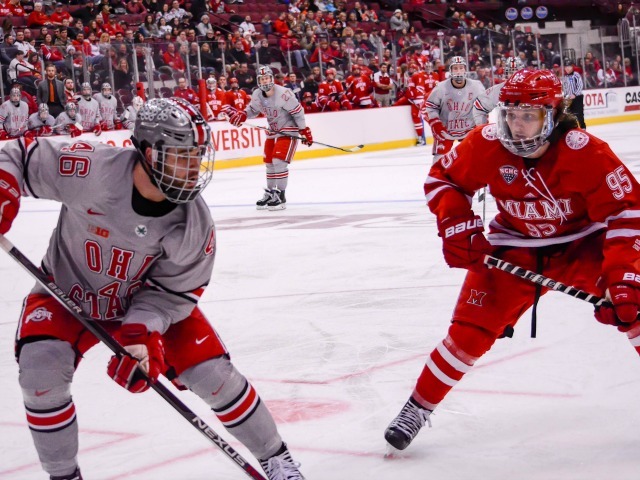 It’s clear once again that Ohio State can’t seem to get over themselves when they were outclassed on the ice on Saturday night. For his efforts this weekend, Riley Barber once again earned the CCHA Rookie of the week award. Barber is the 2-time reigning CCHA Rookie of the Month, and this is his 3rd rookie of the week honor. On Friday night, he had an assist on McKenzie’s goal. He had the OSU goalie beat on his shootout attempt, but his shot hit the knob of the goalie’s stick and didn’t trickle in. He also tallied a goal (the empty net clincher that sent Ohio State fans to the exits) and an assist on Saturday night in Miami’s 3-1 win. Barber now has 8 points and 14 assists on the season, and leads the CCHA in scoring. 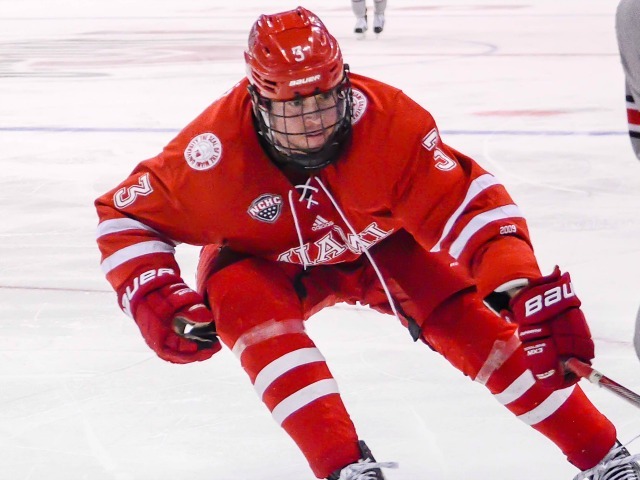 He has left Oxford and is now in New York in hopes of playing for Team USA with teammate Sean Kuraly in the World Junior Championships. Speaking of the WJC, tryouts will start in Finland tomorrow the 19th, and you can keep an eye on Team USA during the tournament on the NHL Network. The 2013 World Junior Championships will be held in Ufa, Russia Dec. 26, 2012 to Jan. 5, 2013. (We’ll post any roster updates and the upcoming schedule when we know more.) The only other CCHA players headed overseas are Michigan freshman Jacob Trouba and Notre Dame freshman Mario Lucia. 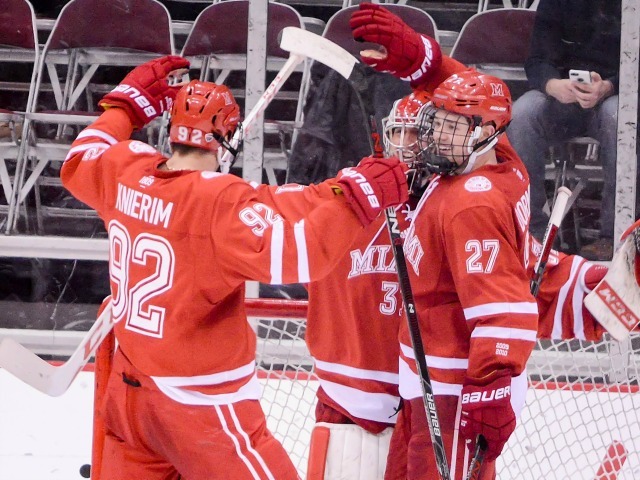 After this weekend, Miami is in a tie with Notre Dame for the top spot in the CCHA. Looks can be deceiving, however, as the Irish have 3 games in hand on Miami. 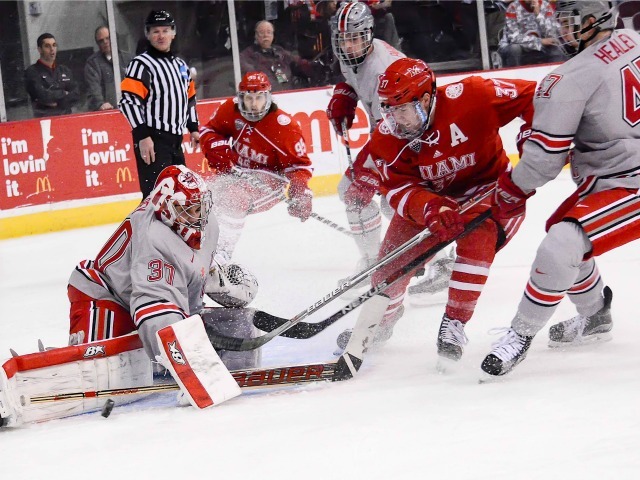 In fact, the RedHawks have played the most games in the CCHA, and 3rd place Western Michigan has 2 games in hand on them and sit just 4 points behind. Meanwhile, Michigan, selected #1 by the media and #2 by the coaches of the CCHA in the preseason polls, sits in a tie for 7th with Alaska and behind teams like Ohio State, Lake Superior State and Ferris State. It should be an interesting second half, that’s for sure. 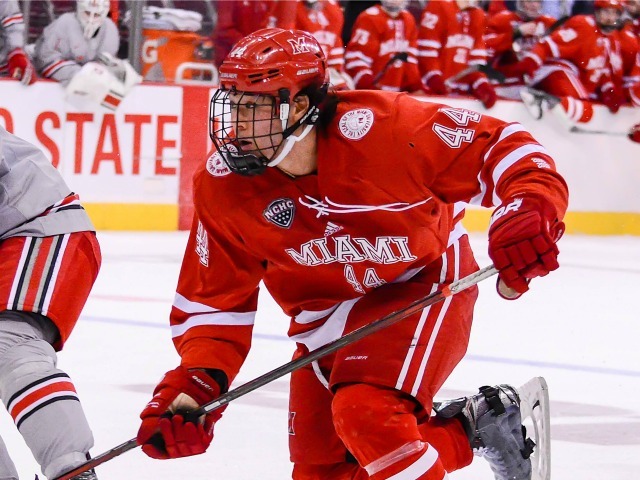 Miami will need to keep taking 5 and 6 points a weekend and also play well in their non-conference games to be well positioned in the PairWise rankings, which will lead to a berth in the NCAA tournament. And finally, let’s take a quick look at the polls. Miami now sits in the #5 spot in both polls, staying exactly where they were last week. Seeing as though it’s the half way point of the season, now is a good time to take a good look at the PairWise, and Miami is currently 9th there. Not a bad place to be, especially considering the recent opponents. Teams like Dartmouth, Yale and Quinnipiac should drop a smidge, and Miami should be able to move up with upcoming opponents like Wisconsin (in Madison January 18-19), Western Michigan (in Kalamazoo February 8-9) and Notre Dame (home and in Chicago on February 15th and 17th). The Hawks will be off for 2 weeks, adn return to action December 28th in the Three Rivers Classic. Miami plays the same Ohio State squad on Friday night, and Saturday’s games will be determined by Friday’s results. It will be Robert Morris or Penn State on Saturday night. Wait what? 3 games against Ohio State? Well, let’s lump them all in together. 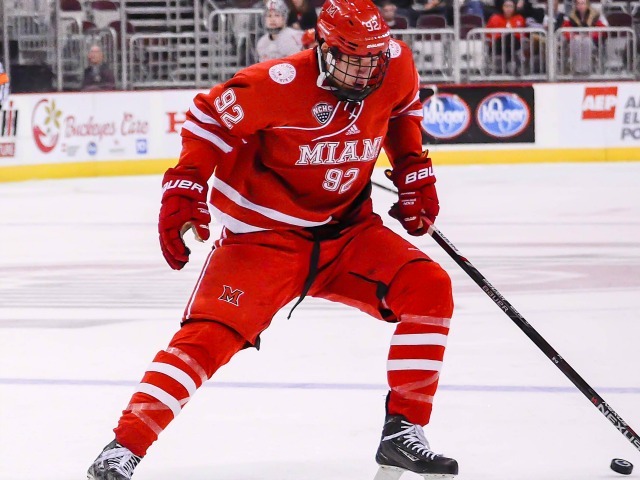 Miami plays this weekend at Ohio State in what could be the last games in Columbus in a good while, and follows that up with a game in between Christmas and New Years in the Three Rivers Classic in Pittsburgh against the same team. That makes 3 in a row. And I want to throw up now. In the effort of having our lunches remain inside of us for now, I’ll spare you the gruesome pictures of Ohio State’s uniform choices in the past, but remind you that they are hideous. We’ll see enough of that on the ice in the next 35 hours or so. Let’s jump in with some comparisons, shall we? Brady Hjelle will be in net for Ohio State, most likely for both games this weekend. He is 5-3-3 on the season with a 1.46 GAA. Not to shabby until you look at Miami’s Fab Freshmen Ryan McKay and Jay Williams. McKay has still only allowed 2 goals in his 4 starts (2-1-1) and Williams is a stellar 8-2-2 on the season, having filled in for McKay for a stretch. On the other hand, Hjelle has started 40 games already in his career, while Miami’s duo is still at only 16 combined games. There will be rubber flying around the rink the next 2 nights, but it may not tickle the twine too often for either side. Where Miami MUST be strong this weekend is on special teams. Last weekend against Lake Superior State, all three goals the Lakers scored were on the power play, and LSSU was 3 for 7 overall. On the season, Miami’s scoring pretty well on their own power play at 15%, but are operating at just 86.2% efficience on the kill. That’s quite the low number compared to years past from the RedHawks under Head Coach Enrico Blasi. On paper, Miami shouldn’t have to deal with too much on the Ohio State side of special teams. 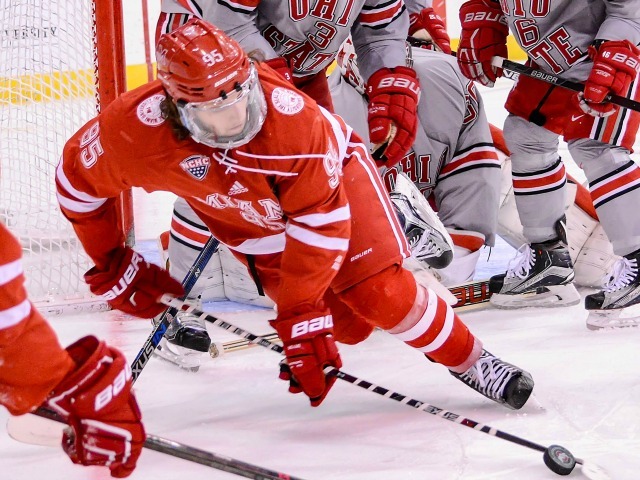 OSU is scoring just 11.4% of the time on the power play and is a paltry 85.7% on the kill. Austin Czarnik will look to cheat the penalty kill and get another SHG – he currently leads the NCAA with 3 shorties so far this season. Ohio State is also in the midst of possibly playing the same team three times in a short span. They had a home and home series against Robert Morris last weekend, and came away 0-1-1. 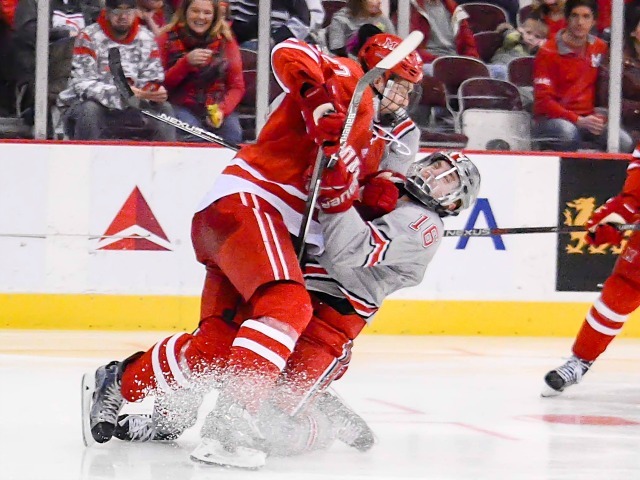 Everyone A team like Ohio State should be able to roll over RMU easily. Instead, OSU lost at home to them 3-2, and then tied them 2-2 in Pittsburgh. 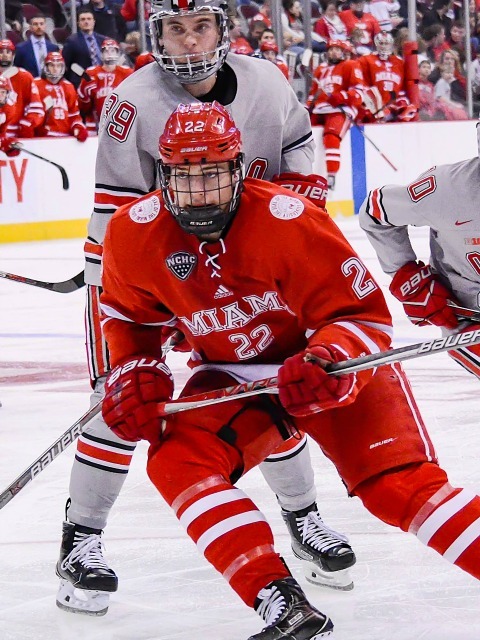 As we know, Miami’s young core of talent leads the way, and only 2 returning upperclassmen are in the team’s top 10 in scoring (Curtis McKenzie is 4-6–10 and Bryon Paulazzo is 2-2–4, Senior Marc Hagel has 2-3–5 in his first season in Oxford). 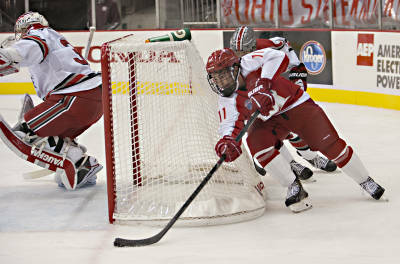 Ohio State is led by Ryan Dzingelberry, who has 6 goals and 8 assists on the season. He is undoubtedly the Ohio State leader and is often seen skating all out and hustling on every play. Stopping him will be another key to the extended series. Tonight’s game will will be televised nationally on the Big Ten Network. 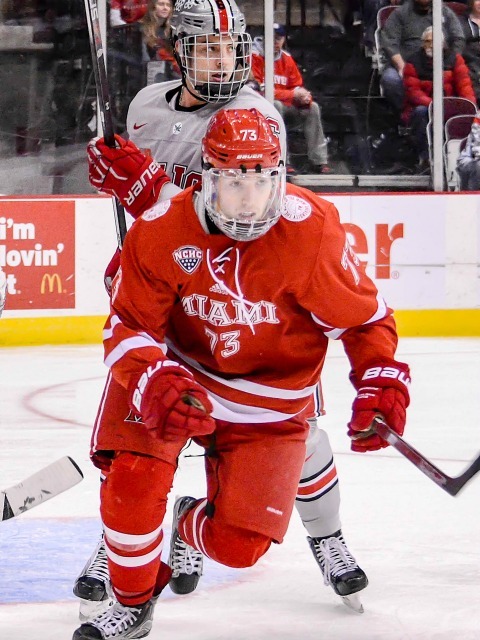 They are also the first games of the Ohio Cup series for Miami among the 3 Ohio teams (Ohio State won and BGSU won a shootout in their series earlier this year). Wouldn’t it be nice to deal a crushing blow to Ohio State on their network? I think so too. Hawks tonight. Other guys tomorrow for the split. If you are travelling to Columbus or are attending with the Miami group, be sure to say hi and drive safely! Enjoy the games, and Happy Holidays everyone!